Portsmouth has a few subtle terrain changes that I don’t think about often. Sometimes you end up somewhere that makes it a bit more obvious, which is the case at City Hall. 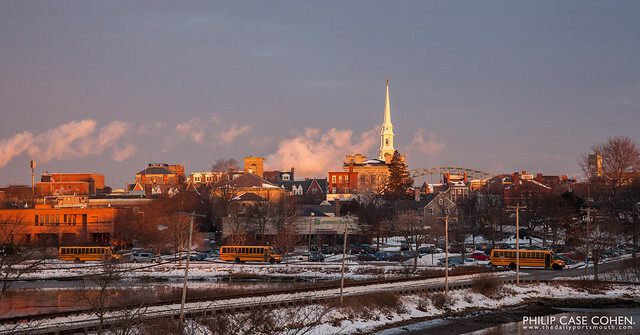 The North Church and the Piscataqua River Bridge can be seen in the distance. The school buses in the foreground add a fun element to the image, along with the industrial fog clouds in the background from the manufacturing plants that line the river. beautifull just beautifull, someday I’ll go back, I am now living in corpus christi ,texas. south texas…..you are a fabulous photographer . you cathe the essance of the town. Love the warm glow and colors. Lovely image.